Which Radiant Heat System is Best for You? Old man winter is providing plenty of incentive for many of us to purchase a hydronic or electric radiant snow melting system, and Warmzone can help you settle on which system to choose for melting snow and ice from your driveway. The good news—both hydronic and electric snowmelt systems are effective, efficient, and surprisingly affordable solutions to keeping exterior porches, walkways and driveways clear and dry. Hydronic systems heat a mixture of hot water and propylene glycol (anti-freeze), then circulate it through a network of polymer Pex tubing installed in asphalt, concrete, or just about any other medium. The water is circulated from a centrally located water heater or boiler through the Pex tubing to warm your sidewalk or driveway. These systems feature condensing boilers that can be powered by any energy source, including natural gas, wood, oil or even solar panels, making operation extremely affordable. Electric radiant snowmelt systems can also be installed in a variety of mediums including hot asphalt, mortar beds, under pavers, and concrete etc. Prior to a concrete pour, heat cable is laid down and secured to the remesh with wire ties. The system’s activation device (in-pavement or aerial-mount snow sensor), communicates with a compact master control unit to send power to the embedded heat cable which quickly and evenly distributes heat to prevent ice and snow build up. Both snow melting systems feature energy efficient, advanced technology backed by impressive warranties. Generally, hydronic is the best pick for larger-scale, commercial snow melting applications because of the potential for lower operating costs; whereas electric radiant heat systems are often the more preferred solution for residential or home improvement projects. Hydronic snow melting systems require a larger investment upfront. They rely on a high-efficiency heater or boiler to function properly, and they cannot be retrofitted in existing driveways, so in addition to the system, you’re looking at the cost of a driveway tear out and pour. The systems also need their own dedicated mechanical room. Electric radiant snow melting systems feature rapid response times and are extremely efficient. They rely on a sensor and a small control unit to operate, so the initial cost up front is decidedly smaller. If you want to save a few bucks on installation, Warmzone’s ClearZone electric radiant heat cable comes on a spool or in pre-configured mats that can be laid out for quick, easy installation. And, ClearZone electric radiant heat cable installation is very easy to customize, so you can configure your system to ideally suit your budget and snow melting needs. You can heat the entire driveway or a strip up the middle or just two 24-inch tire tracks. Electric systems grant you lots of custom options. Probably the biggest incentive for choosing electric radiant snow melting systems is their efficiency in removing ice and snow. Designed to produce 30-50 watts per square foot, ClearZone radiant heat cable has the quickest response time (time to heat the driveway upon system startup) of any snow melting system on the market). Hydronic systems rely on hot water. More time is required to heat the water before it is subsequently pumped through the system, so the response time is considerably less. If you’ve had it “up to here” with snow this winter, it’s not too late to purchase and install a snow melting system. For more information on hydronic and electric radiant snow melting systems, contact Warmzone at 888.488.9276. A FoilHeat radiant heat mat is an excellent way to warm up frosty laminate and even carpeted floors when the weather outside is frightful. If your floors rest on concrete, life at home can be especially chilling during the winter months. As you would expect, cranking up the thermostat to remedy the situation generates even more heat, all of which eventually rises, rather than solving your initial dilemma—cold floors. Made from durable heat-conducting aluminum materials, a FoilHeat radiant heating mat distributes heat quickly and evenly, so it’s not prone to “hot-spots” or localized heating you might expect from forced air, baseboard or other heating systems, making it a great alternative for home heating. FoilHeat is a unique, ultra-thin electric radiant floor heating mat specifically designed for use under laminate, carpet, engineered wood, glued hardwood and other floating floors. This paper-thin grounded flat aluminum sheet can be layered between the installation pad and the floor with virtually no buildup, to deliver uniform heat throughout your home. And don’t let its “thin” skin fool you—FoilHeat maintains a durable yet flexible construction suitable for do-it-yourselfers and professional installers alike. It’s made with fluoropolymer insulated heating cables sandwiched between two layers of specially reinforced aluminum foil to form a strong, yet thin and flexible laminate mat that’s perfect for prolonged use. If you’re intent on installing FoilHeat radiant heat mats in your home, no worries. Each mat is available in a range of nominal outputs and predetermined lengths for easy installation, regardless of the size and shape of your home’s interior flooring, or your heating requirements. Their thin construction can be safely and easily cut and shaped to meet the specific requirements of your project, so they’re a breeze to install, and ideal for efficiently heating any size or shape room, from basements and bedrooms to bathrooms and kitchens. FoilHeat installed on slab to heat basement floor. As with every Warmzone radiant heat system, FoilHeat mats are prefabricated and tested in a carefully controlled factory environment to ensure you receive a reliable product that’s designed to deliver consistent performance, year after year. Each UL-approved FoilHeat mat is watertight, completely grounded and safe enough to install under regularly steam-cleaned carpets or floors, and includes a 15-year warranty and manufacturer installation guarantee to boot. While living over a concrete slab is wonderfully cool during the summer, in winter, it can be the polar opposite. If you’ve already worn out your slippers this season trying to keep warm, give Warmzone a call at 888.488.9276 to discover how a FoilHeat radiant floor heating system can help. Our consultants are the most knowledgeable and helpful radiant heat experts you could hope to talk with. Learn more about your floor heating options today. Thanks for supplying my customer with exactly what they needed. Living in multiple locations, the weather-censored concrete heating system you offer was the perfect match for my Boise, Idaho homeowners. Being new to this type of installation, I expected things to be a little more complicated. A few phone calls after receiving the product within days made the job simple to install. I would have to say that customer service with your company was by far second to none. I look forward to doing business with you in the future and referring you on to homeowners with snow melting needs. If you’ve decided to add a heated driveway or underfloor heating system to your list of home improvement projects, hydronic heat might be the popular choice, but it’s not necessarily the best, or least expensive way to go. Electric radiant heat is a new, equally viable option that may give you some pause when it comes time to fork over that cash you’ve been stashing for your home improvement projects. Let’s say you are considering adding radiant heat to your bathroom-remodeling project. In a small space, typical heating times can make all the difference, right down to the floorboards. A hydronic heated floor system installation requires PEX tubing placed 1½-2 inches into a cement slab for optimal results. At this depth, you could be waiting a few hours for things to heat up. To avoid the inconvenience of those long wait times, most homeowners tend to leave their hydronic heat systems on throughout the winter months, consuming more energy. An electric radiant heated floor can reduce that wait time by as much as 6½ hours. Radiant heating mats can be easily rolled out above the sub-floor, just under the flooring material, and can heat a tile floor in 30 to 60 minutes flat. With more reasonable wait times, programming the system to turn on and off potentially saves you more dollars, and frankly, makes more sense. Installation costs tend to be higher for hydronic heating systems. Returning to our bathroom project, the $300 to $400 you would expect to spend installing a radiant heated floor will cost you upwards of $4,000 to $5,000. The upfront investment for equipment, labor and floor height issues make hydronic systems cost prohibitive in small- to medium-sized areas. Hydronic systems require a boiler, which accounts for a big chunk of the budget. Unlike radiant heated floor mats, hydronic floor heating systems also elevate the floor by a couple of inches, a significant difference that can cause big problems for you during your bathroom remodeling job. 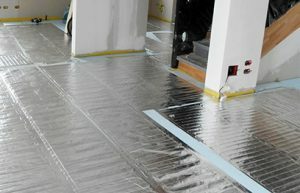 Radiant heated flooring installed will elevate the floor by only ⅛ of an inch. In this scenario, at least, it probably would not make much sense to run a series of tubing for a hydronic system in your bathroom. Installing heat cable in a HeatShield floor heating insulation panel. Of course there is the issue of maintenance and repairs. Hydronic systems circulate continuously, and rely on a system of valves and manifolds prone to sedimentation, mechanical problems and maintenance issues. If a hydronic heating system installation is faulty, it is difficult to find a leak, and because of the nature of the installation, even if the leak is found, it is difficult to repair. With electric radiant heat systems, fault detectors can pinpoint the exact location of a break. After breaking just one or two tiles, the electric cable can be spliced and the tiles replaced, a far better (and less costly) scenario than I’m imagining with our hydronic heated bathroom floor. Fortunately, Warmzone’s electric floor heating systems are built to last and feature the best warranty in the business. Generally, most homeowners opt for electric radiant heating. It’s well suited for small- to mid-sized home improvement projects. And the initial investment is modest enough that you won’t find yourself over your head, or under water when it’s time to tap into your home improvement budget. ComfortTile floor heating mat, cable and thermostat. 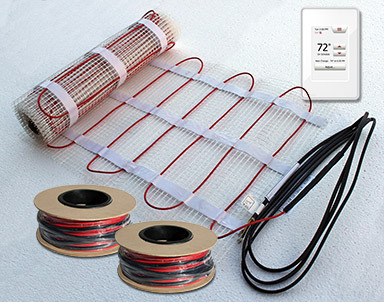 The floor heating mat features pre-spaced heat cable woven into a durable mat that simplifies the installation process. We are nearing the end of another snow season, one that has been especially brutal in terms of snowfall, and it’s likely that most of us have grown tired of shoveling snow from our driveways. As you sit to rest your aching back, imagine a winter without having to shovel snow or throw down any deicing salt. 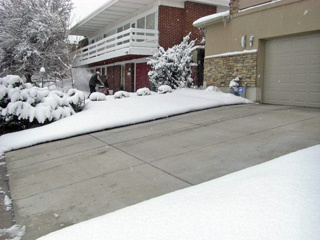 Enter radiant heated driveways and snowmelt systems. Electric radiant snow melting systems are not just a fantasy anymore; they are the ticket to easy snow removal, and a much more pleasant winter. What used to be regarded as a luxury for exclusive upscale neighborhoods is now a reality for all of us. Given the custom options and affordability of radiant snow melting systems, heated driveways, steps and walkways have become increasingly popular among homeowners and businesses alike. Warmzone electric snow melting systems are fully automated, extremely durable and are built to last a lifetime. The advancements in technology have translated into many benefits for consumers, including a wide range affordable installation options. Radiant snow melting systems can be installed in new and existing driveways, and in just about any type of custom configuration. Whether you want your whole driveway surface heated or just the tire tracks or other specific areas, Warmzone can design the ideal snow melting system for you. 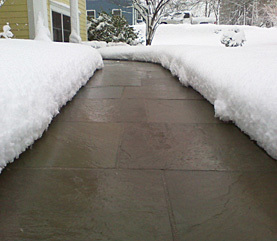 Snow melting systems consist of a heat cable or wiring system installed within the surface of the driveway or sidewalk. When conditions for snow are present, a sensor will automatically signal the control unit which actives the system. The surface is heated and your driveway is now a “snow-free zone”. How much more convenient can it get than arriving at home on a snowy day to a nice clear driveway? No shoveling required! Warmzone is known for its innovative heating solutions. If it kicks out heat better than the competition, chances are Warmzone has investigated it, tested it, or sold it. One of the leading multipurpose product lines available through Warmzone are the patented Powerblanket outdoor heating solutions. While the Powerblanket has specific heat-spreading properties that deliver a lightweight targeted heating solution, it can in no way be said that it does only that. 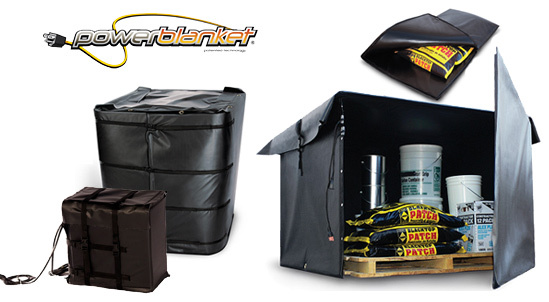 The Powerblanket is a versatile, weatherproof warming blanket that has many universal uses, including heated tote boxes, barrel warmers, concrete curing mats and other solutions that aid in the heating or thawing of various materials and equipment. 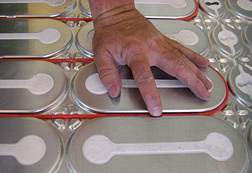 Powerblankets were initially designed as concrete curing blankets in construction jobs. A Powerblanket utilizes electricity to provide the spread of heat which warms concrete evenly during the curing process. What results from the heating power of these concrete curing blankets is the ideal curing with crack-free finish that every project manager dreams of. The Powerblanket helps retain moisture during wet concrete curing, bringing it to the desired PSI more quickly and definitely more efficiently. When Powerblanket is used as a concrete curing blanket, they may be used in both cold and warm weather, in turn protecting the concrete from rapid drying, freezing, or cracking. Powerblankets achieve a compressive strength in concrete of 4300 psi in only nine hours. The result is defect free and a better product all around for the customer. Powerblanket doesn’t stop there however. Although most often associated with construction jobs, many customers are finding out about the many uses of this versatile warming blanket. Even though they are designed to be durable enough for the largest construction projects the Powerblanket can be used for many home projects. If you do any projects outside you may find that your list of uses for a warming blanket is extensive. You may not have known that one product could achieve so many results. If you have need to thaw ground during cold months, simply plug in a Powerblanket and let it go to work for you. Cemetery workers often use Powerblankets for this purpose. Another helpful application is for equipment warming. This includes tractors, machines, construction tools, snowmobiles, and engine warmers. 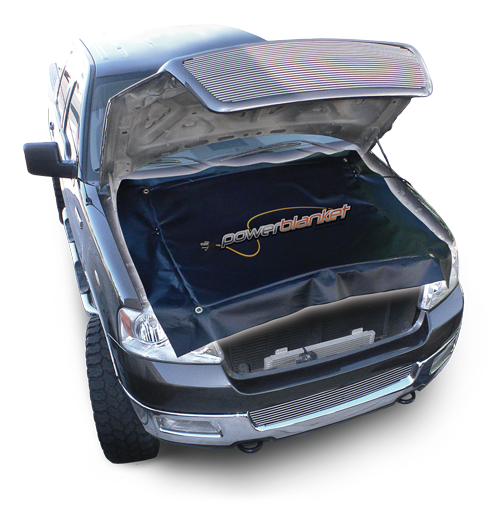 If dependable start-ups on cold winter mornings are a must for you, the Powerblanket engine warmer may be your best cold-weather friend. All that is required is a 120V outlet. What about outdoor pets or livestock? They need to be kept warm year-round. Powerblankets are proven to be durable and safe enough for animals to walk or sleep on. Drop it, roll it up, or even fold it, you can’t hurt this durable heating blanket, and neither can your animals. This is an ideal way to keep your animals warm during winter as well as keep water troughs from freezing. Should you require the use of any liquids or gases in the freezing days ahead, wrap a Powerblanket around any container and keep the liquid flowing. Powerblankets are available for heating small paint containers, propane tanks, barrel heaters and water containers, and other temperature sensitive materials. And don’t forget about protecting exposed pipes during cold winter nights. The Powerblanket warming blankets provide safe, efficient pipe freeze protection quickly and safely. This eliminates the need for expensive propane burners. Versatile, handy, user-friendly, affordable to operate and oh-so-many uses! The Powerblanket is a product worth investigating for any outdoor warming needs. If you have any hesitation about installing an electric snowmelt system for fear of jeopardizing your homeowner’s insurance, let’s clear this up now. Some fear that enjoying the benefits of a heated driveway means you have to forfeit certain benefits on your insurance policy. Not so with any Warmzone snow melting system. Using any of our radiant heated driveway cables is safe and approved for use in residential properties. Each Warmzone driveway snow melting system is UL safety approved for both residential and commercial use. Warmzone electric snowmelt systems meet the highest industry standards of safety to ensure there is no added risk for fire damage. These industry-leading snowmelt systems are designed to be fail proof and maintenance free. If a heating cable does become cut or damaged in any way, the system’s GFEP (Ground Fault Equipment Protection) will automatically shut-down the power to the system. This enables repairs to take place before any hazardous effects come into play. 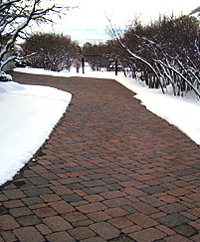 Having a heated driveway has many benefits, including energy-efficient automated operation. Warmzone snowmelt systems have been designed with smart technology to keep the electric radiant heat working properly and safely. Warmzone offers snowmelt systems that feature an impressive 10-year manufacturer warranty which includes up to five times the initial cost to offset costs of reinstalling any defective cables.